A bathroom wall doesn’t have to be a bland and blank space, you can add useful items that not only serve a convenience in the bathroom, but that add a design to your wall. If you think of a bathroom that has nothing on the walls, it’s going to look like a blank canvass, boring with nothing to offer. Now you don’t want to add pretty pictures on the walls, but there are three ideas on ways you can add something that makes the wall stand out. With so many bathroom designs moving in the direction of luxury this year, feature walls are becoming very popular. A feature wall can be one bright wall surrounded by white walls, a decoration wall made of stone or a wall that has something unique and special, maybe something so out there, such as a water wall. Why not? It’s your bathroom. Another great bathroom feature that is placed on a wall is designer radiators. Gone are those ugly white radiators that are mounted to the floor, the bathroom radiators are decorative and serve a great purpose. From the warmth they provide to the fact you can place your towel over them to offer you a warm towel to wrap around you when you get out of the shower or bath, decorative radiators are a stylish and elegant addition to any bathroom design. Another fantastic addition to a bathroom wall is the mirror cabinets with lights. These offer functionality, practicality, convenience and they are decorative. You can place your cabinet strategically so that it enhances the space by bouncing the natural light you get from the window into the bathroom space. This will help make the bathroom feel more spacious, light and bright. These mirror cabinets with lights offer other great benefits. They offer a storage space for all your smaller bathroom items, immediately reducing the clutter in the bathroom. The biggest problem with many bathrooms today is not having enough storage. They also offer extra light, now if you have a darker bathroom that doesn’t benefit from natural light, the mirror cabinets with lights offer that extra light that can make such a huge difference to the space. Never mind the lights ensure that you enjoy a clear reflection when getting ready in the morning and rushing to work. Having your toiletries, make up or shaving items in the cabinet and then having the mirror and lights right there to shave minutes off your time each morning. The one thing that many bathrooms do not benefit from is additional storage. Often no matter what cupboards you place in your bathroom, you will always need more. The bottles of medicine, make up and shaving items can quickly build up and you need a good and stylish place to store them. Back lit mirror cabinets not only offer you that additional storage, they are convenient and practical putting all your items together with your mirror and additional lighting, saving you time in the mornings when getting ready for work. The back lit mirror cabinets are stylish in design, they ooze elegance and blend in beautifully with any bathroom design, both modern and traditional. Being available in a choice of sizes and styles, it’s easy to find the right back lit mirror cabinet for your bathroom. 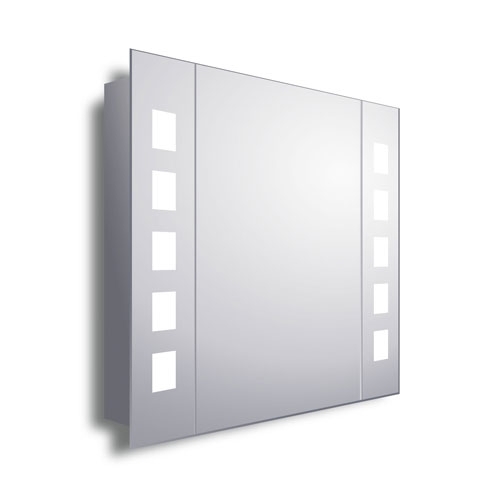 This back lit mirror cabinet is rectangular in shape with a modern and elegant feel. It has frosted glass sides where the lights shine through illuminating the mirror and giving you a clear reflection whether you’re shaving or putting on your make up. 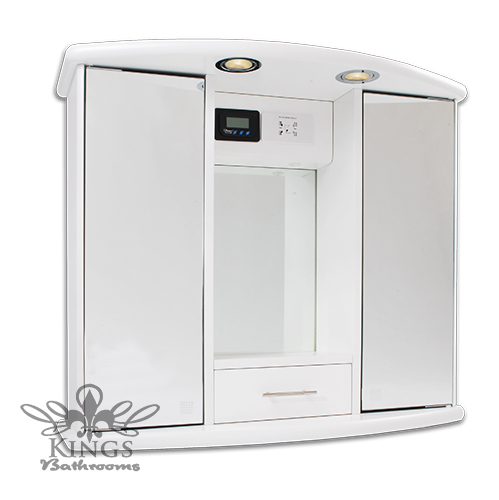 The modern style continues inside the cabinet with clear glass shelves to store all your bathroom items. These back lit mirror cabinets are modern in design with two handy fixed shelves to store all your toiletries, make up and shaving items. There are frosted glass strips down either side that let the light shine through enhancing the mirror and make it a beautiful piece of art work on your bathroom wall. These mirror cabinets are a contemporary design, the rectangular shaped cabinet comes to a point at the top which lights up making this a favoured back lit mirror cabinet for many households. There are two fixed shelves inside offering more than enough storage for your smaller bathroom items and the magnetic closures on the doors just finish off that perfect design. These back lit mirror cabinets are modern and minimalistic and the perfect choice for ultra modern bathroom designs. The back lighting is at the top of the rectangular shaped design with pointed top and is a clear frosted class that illuminates. These mirror cabinets are elegant, stylish and minimalistic making them the perfect choice for modern bathrooms. The two fixed shelves offer more than enough space to store all your medicines, toiletries and more. Your bathroom is looking tired, it needs a little something to bring it into our century. Maybe you’ve recently moved to a new home and remodelling the bathroom isn’t on the cards right now or you just want to add something different to your bathroom to give it that wow factor. There are quite a few things you can do to give your bathroom a modern feel without paying out fortunes of money. There are small things that can make a huge difference. Winter is here so it’s time to start all the odd jobs around the home. Winter is the perfect time to paint your bathroom, on a cold day when going out isn’t appealing, grab a tin of white or very light bathroom paint and get painting. You can make the painting of the bathroom a fun family activity, get everyone involved. To get the modern look you will want a white, the lighter and brighter the better. The one thing many of us struggle with in our bathrooms is the clutter than you end up with. From your medications to make up and toiletries to hair care products, the clutter just seems to grow. Mirror cabinets with lights are a welcome addition to any bathroom. The mirror cabinets with lights come with a range of advantages and are an affordable way to give your bathroom the necessary face lift it deserves. Available in a range of sizes and shapes it’s easy to find a cabinet that blends in with your bathroom design, while the additional light can make a huge impact on the overall bathroom style. These mirror cabinets with lights concentrate the light on the bathroom mirror, this means speeding up your morning bathroom routine, being able to use the bathroom without bothering everyone around you by turning on the light and adding that extra light necessary to make your bathroom feel spacious. If you’re aiming for a modern bathroom you have chosen white walls and chrome taps and shower fittings. If you can add a modern radiator to your bathroom, this works as a wonderful piece of artwork on a bland wall while offering you the warmth you need when getting out of the bath on a really cold day. You can add your splashes of colour by including brightly coloured towels, a bright blind for the window or some brightly coloured candles along the side of the bath or next to the basin. That’s all you need to do to give your bathroom an affordable make over. When you add anything into your bathroom you want to know that it is useful and comes with a host of advantages. Well it’s fair to say that you get all of this with the back-lit mirror cabinets. Now you may be wondering why I would choose to write about the advantages these back-lit mirror cabinets have to offer, but when you think of the three main things you need in your bathroom when rushing to work each morning, these cabinets cover all the bases. The first advantage to the back-lit mirror cabinets is the ability to remove all the mess lying around your bathroom. With these cabinets you now have space to store all your medicines, toiletries, make up and hair products. With these items having their own hiding place when not in use, your bathroom will begin to look neater. Now you just need to find that hiding place for your towels and the laundry on the floor that your children forget to pick up and you are on your way to a clutter free bathroom. One of the things that can make a bathroom feel more spacious is light. A bathroom that overflows with natural light is a spacious bathroom, even if it’s a small bathroom, it has that wonderful spacious feel. We can’t all have bathrooms that have natural light, our small bathroom window may not offer the light we need, so we make up for it with lighting. The back-lit mirror cabinets offer extra lighting for your bathroom while looking modern and stylish. The gentle light cascades from behind the cabinet, offering a wonderful glow of light that can help enhance the space. The last advantage of a back-lit mirror cabinet is that you get a mirror to use in your bathroom. Mirrors have their own advantages, they are not only a useful essential in the bathroom, but they help enhance the light that comes into the room. Having your cabinet, mirror and light in one place makes getting ready in the morning an easy and smooth flowing process. You don’t have to move around, but can stand in one place to grab items from the cabinet and then using the light and mirror you can see what you are doing, shaving off precious minutes in the mornings.